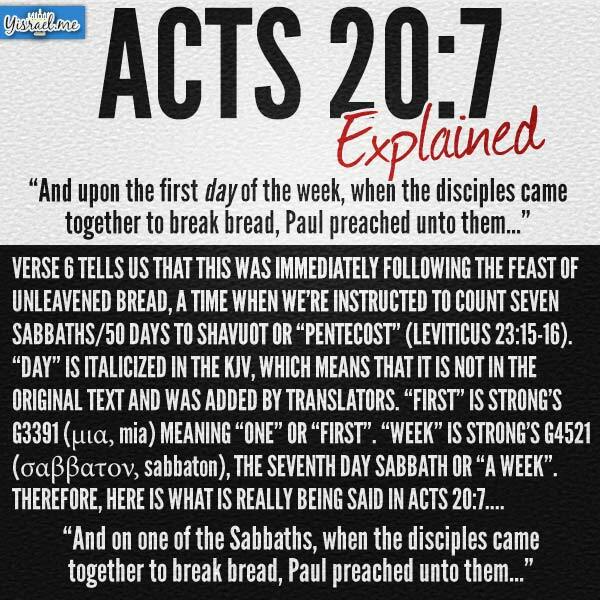 Acts 20:7 – Did Paul preached on Sunday? Begin to learn Torah (Moses) on each Sabbath and apply it as you go along (verse 21)! Most likely you are not a gentile. For further information on the word “gentile” please read: “Who is a gentile anyway?” from TorahIs4Today. Thank you and Yah bless you. For permissions to reprint, see below. Open up most Christian commentaries on the book of Acts and you’ll see that most commentators interpret God’s words in verse 13 as a command for Peter to eat unclean animals, and verse 15 as a declaration that all foods are now clean. Thus, in this passage, God is hereby overturning all of the OT dietary laws, essentially nullifying two whole chapters of the bible (Leviticus chapter 11 and Deuteronomy chapter 14), and calling into question a great many passages in the NT, in which believers are told to avoid ‘uncleanness’ (Rom 6:19, 2 Cor 12:21, Gal 5:19). Why does Peter refer to what is on the sheet with the words ‘common’ [koinos] and ‘unclean’ [akathartos] in verses 14 & 15, and what’s the difference between these words? Why does God only correct Peter’s use of the word ‘common,’ and not his use of the word ‘unclean’ in verse 15? When God tells Peter to kill and eat, why doesn’t Peter just obey God, take a clean animal from the sheet (like a cow or a chicken), kill it, and eat it? After all, the sheet contained “all kinds” of animals. And why, after walking with Jesus all that time, was Peter still under the impression that he could not eat anything unclean? And why does Peter still not understand his own, even after having the sheet lowered three times? And lastly, why doesn’t Peter ever interpret his own dream as having anything to do with food? “they fell silent. And they glorified God, saying, Then to the Gentiles also God has granted repentance that leads to life” (Acts 11:18). So what is the difference between common [koinos] and unclean [akathartos]? 14 But Peter said, By no means, Lord; for I have never eaten anything that is common [koinos] or unclean [akathartos]. 15 And the voice came to him again a second time, What God has made clean, do not call common [koinos]. The Greek words ἀκάθαρτος [akathartos / unclean] and ἀκαθαρσία [akatharsia / uncleanness] occur around 200 times in the Septuagint (the first century Greek bible, aka. LXX), and around 40 times in the New Testament. In the LXX they refer to all manner of uncleanness, including the unclean meats in Leviticus 11 and Deuteronomy 14. Almost any time the word ‘unclean’ is used anywhere in the Septuagint, the Greek words akathartos or akatharsia are being used. The Greek words κοινός [koinos, “common”] and κοινόω [koinoō, “to make common”] are used only 4 times in the canonized books of the LXX, each time referring to things “shared in common” (in the LXX, see for example, Proverbs 1:14, 21:9). So in the LXX, the Greek words koinos and koinoō are never used to refer to “uncleanness” or to something as “unclean.” Thus, it can be inferred that Luke would not have used these words interchangeably. They would have represented distinct concepts in his mind and in the minds of his Greek speaking audience. This is strong evidence for the fact that referring to things as “common” (koinos) was a later pharisaic development (i.e. a manmade tradition), not found in the Law of God (Torah). A tradition which served to differentiate 1st century Jews from the surrounding gentile culture. 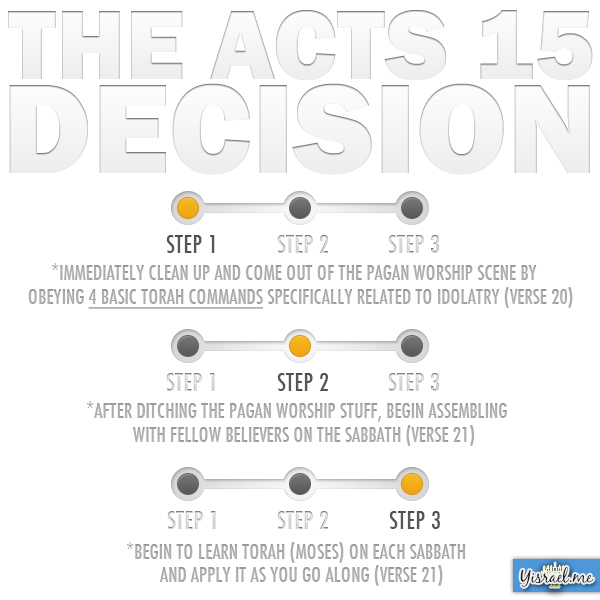 If you’ve studied the history leading up to the first century, this might make more sense because it’s not until the book of Maccabbees that we see koinos/koinoō start to gain the connotation of ‘defilement’ or ‘unacceptableness’ that we see in Acts 10 — but this would be a separate study in itself. Koinos refers to situations not covered in the Law of God (Torah), in which something clean (a pot, a utensil, a clean animal, or even a person) comes into contact with something unclean (an unclean animal, dirt, etc), rendering the clean thing defiled or unacceptable. The Pharisees viewed these previously clean things as now being “common” [koinos]. So in a sentence, the difference between koinos and akathartos (common and unclean), is that koinos (common) connotes the pharisaic belief (based in tradition) that a clean thing can be made ‘common’ through contact – whereas akathartos (unclean) connotes that which God has declared to be unclean. Even though Mark 7 isn’t a part of this study, it deals with this exact problem (for a full explanation of Mark 7, read the article here). Remember this is where the disciples were eating with ‘common’ [koinos] hands, and the Pharisees reprimand them for not abiding by their traditions. Mark 7 isn’t about food – rather, it’s about Pharisaic traditions that were being put on par with the Law of God (the Torah). Thus, Jesus reprimands the Pharisees right back, telling them what really makes a person common. But I digress. When the sheet comes down in front of Peter, on it are, “all manner of fourfooted beasts of the earth, and wild beasts, and creeping things, and fowls of the air” (Acts 10:12). In other words, clean and unclean animals, all writhing and tossing and turning over one another. This is the purpose of the image of a sheet coming down, held up by its four corners. It emphasizes that these animals aren’t just close to each other – they are squirming all over one another. So even though there are clean animals on the sheet, Peter refuses to eat any of them because some were unclean, and the rest were clean, but they had been made common [koinos] according to the Pharisees, because they were in direct contact with unclean animals on the sheet. Keep in mind, there is no mention in Leviticus or Deuteronomy that an unclean animal can touch a clean animal and make that clean animal unclean, which makes this a Pharisaic prohibition very similar to the washing of hands in Mark 7, where it was taught by the Pharisees that all Jews must wash their hands before eating (and wash various vessels and utensils before ordinary use). In fact, you will notice that the term “common” [koinos] is also used in Mark 7:1, referring to the disciples’ dirty hands, because it was believed that dirt defiled their hands, and that this defilement would transfer to the individual if a person ate or drank with dirty (common) hands. This, in their eyes, would make the person common [koinos] or defiled – but please note that this is nowhere found in God’s Law (Torah). So this explains why Peter would not grab a clean animal from the sheet and eat it, and why God corrects this inclination in verse 15: “And the voice came to him again a second time, ‘What God has made clean, do not call common [koinos].’” Notice that God doesn’t correct Peter’s use of the word ‘unclean’ [akathartos] in verse 15. He doesn’t tell Peter “what God has made clean do not call unclean.” This is because God would be contradicting himself when he gave the food laws back in Leviticus and Deuteronomy. So in effect, Peter did not obey God because he was following the traditions of men – thus the rebuke. It also explains why Peter, after walking with Jesus all that time, never understood him to have overturned God’s instructions on eating a holy (set apart) diet. Surely Peter would have realized at some point, “oh yea, God did away with all that food stuff.” And yet Peter’s interpretation of his own dream has nothing to do with food. It also explains the connection Peter draws between his dream and his meeting with Cornelius. According to the Jewish traditions of the day, many products and practices of Gentiles were regarded as being “common” or conveying “commonness” to Jews. This is why Peter was not going to enter the house of Cornelius up until this point. Just like Pharisaic traditions prevented Peter from eating common [koinos] food, they also prevented him from meeting with common [koinos] people (i.e. Gentiles), shaking their common hands, entering their common home, sitting in their common chairs, eating at their common table, etc. But God used this dream to show Peter that he should not call any person common or unclean (verse 29) — effectively breaking down a large dividing wall that these manmade traditions had erected. To quote Jesus, the Pharisees once again make void the word of God by the tradition that they have handed down (Mark 7:13), because God has always intended Israel to be a light to the nations (gentiles), so that salvation may reach the end of the earth, yet Israel’s own traditions kept her from doing just this. So God, then, used Peter’s Vision to break down a barrier (a dividing wall) that the Jewish traditions of the day had erected – a barrier that severely hindered the spread of the gospel to the nations. The food laws as they are given in the Torah were never intended to impede this. The Torah is intended to point out how God’s people might live holy (set apart) lives, by the power of the holy spirit. God’s intent was that by her light, Israel might draw the surrounding nations to herself. However, according to Acts 10 it was the manmade traditions of the day (many of which carried the force of law, cf. 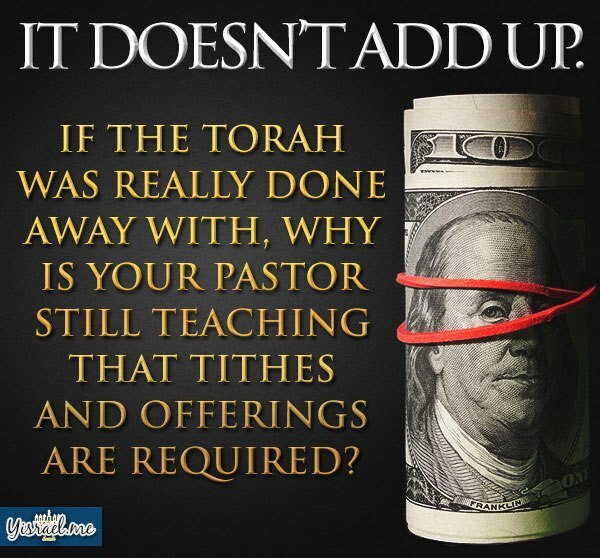 Acts 10:28) that kept Jews from associating with gentiles, and kept the gospel from traveling out into the nations. As members of the Household of God then, let us be wise in the traditions we choose to keep and not keep. Traditions can be good if they enrich our lives and serve the will of God as it is revealed in scripture. But they can be a burden and a hindrance when they conflict with God’s greater purposes. Is your pastor still teaching this? Watch the whole video. Pay close attention to the second half. Trust me! Link to, share, tweet, tumble and RE-post! Do you know how to share the Gospel with Jewish people? These are not people who are simply ignorant of the truth in Scripture. Have you met any arrogant self-righteous Christians? These are not people who are simply ignorant of the truth in Scripture but are people who become arrogant, self-righteous, mean, angry, so on and so forth, when you try to tell them about what you have learned and the what and why of the errors of Christianity. Don’t argue with them. Just start with asking them these questions and tell them the Scriptural answers below. -Was the Law (Torah) done away with? -Did Messiah really come to put an end to His Father’s commands? -How can something (Torah) that The Creator called “Good” and “True” and “Holy” ever be “done away with”? Are you a human or a sexual preference? A persons sexuality is not their identity! Since when does a person’s sexuality define them into category of humankind/people group? It does not! However YHWH does define sin and types of sins and based upon them people can be defined based on their sin. “Or do you not know that the unrighteous will not inherit the Kingdom of Elohim? Do not be deceived. Neither whores, nor idolaters, nor adulterers, nor effeminate, nor homosexuals,nor thieves, nor covetous, nor drunkards, nor revilers, nor extortionists, will inherit the Kingdom of Elohim”(1 Corinthians 6:9-10). Matthew 4:17 From that time Yeshua began to preach, and to say, Repent: for the kingdom of heaven is at hand. Luke 13:3 I tell you, No: but, except you repent, you shall all likewise perish. Acts 2:38 Then Peter said to them, Repent, and be baptized every one of you in the name of Yeshua Messiah for the remission of sins, and you shall receive the gift of the Holy Spirit. Acts 3:19 Repent you therefore, and be converted, that your sins may be blotted out, when the times of refreshing shall come from the presence of YHWH. Romans 6:23 For the wages of sin is death; but the gift of God is eternal life through Messiah Yeshua our Master. 2 Peter 3:9 YHWH is not slack concerning His promise, as some men count slackness; but is long-suffering to us-ward, not willing that any should perish, but that all should come to repentance. Most theologians assume that God’s laws regarding clean and unclean meats ended at Christ’s crucifixion. They suppose that the New Covenant removes any need for Christians to keep such laws. But is that what the Bible really says? The administrative change from the Levitical priesthood to the ministry of Jesus Christ did not void God’s expectations that His people obey His law of clean and unclean meats (or any other law) as part of their sanctification or separation as people of God (see Leviticus:11:44-47; 19:2; 20:7, 22-26; 21:8). Peter and Paul both spoke of the continuing need for God’s people to be holy (Ephesians:1:4; 1 Peter:1:14-16). Scholars acknowledge that members of the early Church continued to observe the distinctions between clean and unclean meats. Because of the common misconception that the New Covenant abolishes much of God’s law, many assume these food requirements were simply Jewish cultural practices that continued until the Church became more gentile in composition and outlook. Preconceived ideas have also influenced interpretations of many New Testament passages. This is known as the process of eisegesis , or reading one’s own ideas into Scripture. Let’s examine the New Testament passages dealing with food. As we do so, let’s practice exegesis: drawing meaning out of Scripture by thoroughly understanding the background of a passage as we seek to apply it. Peter’s vision: Have all meats been cleaned? One often-misunderstood section of the Bible concerns Peter’s vision in which he “saw heaven opened and an object like a great sheet bound at the four corners, descending to him and let down to the earth.” In this sheet “were all kinds of four-footed animals of the earth, wild beasts, creeping things, and birds of the air.” Peter heard a voice tell him, “Rise, Peter; kill and eat” (Acts:10:11-14). Assuming the vision meant that he should eat unclean animals, Peter’s spontaneous response was, “Not so, Lord! For I have never eaten anything common or unclean” (verse 14, emphasis added throughout). This same vision came to him three times (verse 16). At this point many readers, without finishing the account, assume they know the meaning of the vision: that all kinds of flesh can now be eaten. These scriptures, however, show that that is not at all what Peter understood. On the contrary, he “wondered within himself what this vision which he had seen meant” (verse 17). Later Peter realized the significance of the revelation, that “God has shown me that I should not call any man common or unclean” (verse 28). Recognizing the true intent of the vision, Peter baptized the first gentiles (non-Israelites) called into the Church (verses 45-48). This divine disclosure, we see from reading further in the account, did not concern food at all. Rather, it concerned people. Because the Jewish religious leaders at the time of Christ had considered gentiles to be unclean, this dramatic vision righted this common misconception that had come to affect Peter and other members of the Church. It demonstrated that God was opening salvation up to members of any race; gentiles whom God called were now welcomed into the Church. Far from abolishing God’s instructions against eating unclean meats, these verses clearly show that Peter, almost two decades after Christ’s death, had “never eaten anything common or unclean.” Nor is there evidence that he ate unclean meats after this experience. He obviously continued to obey God’s laws about meats that could and could not be eaten and saw no reason to change. He realized that the vision could not be annulling God’s instructions, thus he “thought about the vision” until he understood its true meaning (verses 17-19, 28). When reading through the New Testament, one does find references to a controversy in the early Church involving food. A careful examination of the scriptures, however, reveals the issue to be different from what many assume. In 1 Corinthians 8 the apostle Paul discussed “the eating of things offered to idols” (verse 4). Why was this an issue? “Meat was often sacrificed on pagan altars and dedicated to pagan gods in Paul’s day. Later this meat was offered for sale in the public meat markets. Some Christians wondered if it were morally right for Christians to eat such meat that had previously been sacrificed to pagan gods” ( Nelson’s Illustrated Bible Dictionary , Thomas Nelson Publishers, 1986, “Meat”). It is interesting, though not conclusive, to note that in Acts:14:13, the only passage in which the type of animal sacrificed to idols is mentioned, it was oxen-clean animals-that were about to be offered. This controversy was not over the kinds of meat that should be eaten. Obedient Jews of the day, in accordance with God’s instruction, did not consider unclean meat even to be a possible source of food. Instead, the controversy dealt with the conscience of each believer. Paul explained that “an idol is nothing” (1 Corinthians:8:4) in clarifying that it was permissible to eat meats that had been sacrificed to an idol. That an animal had been sacrificed to a pagan god had no bearing on whether the meat was suitable to be eaten. Paul continued: “However, there is not in everyone that knowledge; for some, with consciousness of the idol, until now eat it as a thing offered to an idol; and their conscience, being weak, is defiled. But food does not commend us to God; for neither if we eat are we the better, nor if we do not eat are we the worse” (verses 7-8). When a believer bought meat in the market or was invited to a dinner at which meat was served, it was not necessary to determine whether it had been offered to an idol, said Paul (1 Corinthians:10:25-27). His concern was that the brethren be considerate of others who believed differently. He taught that in such cases it was better not to eat meat than to risk causing offense (1 Corinthians:8:13; 10:28). This question of meat sacrificed to idols was a major controversy in New Testament times. It is the foundation for many of Paul’s discussions of Christian liberty. Unlike God’s law of clean and unclean animals, which was clearly recorded in the Old Testament, the Hebrew Scriptures do not discuss the matter of food offered to idols. But in the first-century world of the New Testament this issue varied in significance and importance to members according to their conscience and understanding. The chronological relationship between Paul’s letters to the Corinthians and Romans is another important piece of background information often overlooked. Many believe that Romans 14 supports the idea that Christians are free from all former restrictions regarding meats. Verse 14, in which Paul wrote, “I know and am convinced by the Lord Jesus that there is nothing unclean of itself; but to him who considers anything to be unclean, to him it is unclean,” is often cited as a proof text (see “Understanding ‘Unclean’ in Romans 14,” p. E11). This approach, however, fails to consider the author’s perspective and the context of his letter to the Roman church. Many Bible resources agree that the book of 1 Corinthians was written about 55, although Romans was probably written from Corinth in 56 or 57. As demonstrated above, the food controversy in Corinth was over meat sacrificed to idols. Since Paul was writing to the Romans from Corinth, where this had been a significant issue, this subject was fresh on Paul’s mind and is the logical, biblically supported basis for Romans 14. Those who assume the subject of Romans 14 is a retraction of God’s law regarding clean and unclean animals must force this interpretation into the text because it has no biblical foundation. The historical basis for the discussion appears, from evidence in the chapter itself, to have been meat sacrificed to idols. Verse 2 contrasts the one who “eats only vegetables” with the one who believes “he may eat all things”: meat as well as vegetables. Verse 6 discusses eating or not eating and is variously interpreted as referring to fasting (no eating or drinking), vegetarianism (eating only vegetables) or eating or not eating meat sacrificed to idols. Verse 21 shows that meat offered to idols was the dominant issue of this chapter: “It is good neither to eat meat nor drink wine nor do anything by which your brother stumbles or is offended or is made weak.” Both meat and wine were commonly offered to idols in the Roman world, with portions of those offerings then sold in the marketplace. What is the point of Paul’s instruction in Romans 14? Depending upon their consciences, early believers had several choices they could make while traveling or living in their communities. If they did not want to eat meat that had been sacrificed to idols, they could choose to fast or eat only vegetables to make sure they did not consume any meat of suspicious background that might offend their conscience. If their consciences were not bothered by eating meat sacrificed to idols, they could choose any of the options. Within this context, Paul said, “Let each be fully convinced in his own mind” (verse 5) because “whatever is not from faith is sin” (verse 23). Romans 14 is, in part, a chapter on Christian liberty-acting according to one’s conscience within the framework of God’s laws as they pertained to meat sacrificed to idols. Understood in its context, Romans 14 is not a permit to eat pork or any other unclean meat. When one understands that the historical food controversy of the New Testament dealt with meat sacrificed to idols and not which meats were clean, other scriptures become clear. Another often misunderstood passage is Mark:7:18-19. Here Jesus said, “Do you not perceive that whatever enters a man from outside cannot defile him, because it does not enter his heart but his stomach, and is eliminated, thus purifying all foods?” The subject here was unwashed hands (verse 2), not which meats could be eaten. The purification of food referred to the way the body’s digestive process eliminates minor impurities such as those that might be present from eating with unwashed hands. The Pharisees, like Jesus and His disciples, ate only meat specified as clean in the Pentateuch. They objected, however, to the fact that Jesus and His disciples did not go through the Pharisees’ customary ritual of meticulously washing up to the elbows before eating. Jesus, whose hands were sufficiently clean for eating even if not sufficiently clean to meet the Pharisees’ humanly devised standards, explained that the human body was designed to handle any minute particles of dust or dirt that happened to enter it because of ritually unclean hands. He further suggested that, if the Pharisees were serious about wanting to obey God, they needed to revise their priorities. Cleansing one’s thoughts is eminently more spiritually important than washing one’s hands (verses 20-23). The New International Version of the Bible renders the latter part of verse 19: “(In saying this, Jesus declared all foods ‘clean’).” The New American Standard Bible similarly offers: “([Thus He] declared all foods clean. )” These translations stand in stark contrast to the King James and New King James versions, which indicate that the bodily digestive process purifies food as opposed to Jesus making a pronouncement reversing God’s laws on which meats to eat. Which view is correct? The King James and New King James renditions best fit the New Testament culture wherein only clean meats were eaten. They also fit the context, which concerns eating with ceremonially unwashed hands rather than deciding which kind of flesh is suitable to be eaten. Notice that in both the NIV and NASB the latter part of verse 19 is placed in parentheses, as though Mark were explaining Jesus Christ’s words. This is clearly an interpretation of the original wording of Mark’s Gospel. In the original Greek the words “In saying this, Jesus declared” (NIV) and “Thus He declared” (NASB) are not present; translators have added them to try to explain what they think Mark intended and as a result have placed their own mistaken interpretations on Jesus’ words. Putting together all the scriptures on the subject helps us understand the correct biblical perspective (See “How Should We Interpret Scripture?,” page E7 ). When we see from passages such as Acts 10, discussed earlier, that Peter had not eaten unclean meat years after Christ’s death, it becomes obvious that Jesus’ disciples did not believe that He had abolished the commands against eating unclean meats. Such a view simply cannot be sustained in the light of clear scriptures to the contrary. No New Testament passages describe Christians eating meats that had been considered unclean; such a view is glaringly absent in the Bible. On the contrary, we do find many clear scriptures in which the apostle Paul vigorously and repeatedly upholds adherence to God’s laws (Acts:24:14; 25:8; Romans:3:31; 7:12, 22), as did James, the half-brother of Christ (James:2:8-12; 4:11) and John (1 John:3:4). Violating God’s dietary laws would have been unthinkable to them. When Paul wrote that Christians should “let no one judge you in food or in drink, or regarding a festival or a new moon or sabbaths” (Colossians:2:16), some assume the believers he was addressing were eating pork and other meats previously considered unclean. Again, the Bible nowhere supports this assumption. In reality, the issue of clean and unclean meats is not addressed in this section. Paul doesn’t discuss which foods the Colossians were consuming; the Greek word brosis , translated “food,” refers to “the act of eating” ( Vine’s Complete Expository Dictionary of Old and New Testament Words, Thomas Nelson Publishers, Nashville, 1985, p. 245). Although many assume that Paul’s criticism is directed at teachers who advocated Old Testament practices (such as following the law and practicing circumcision), there is no proof to support this. However, we should recognize that perversions of proper biblical practice abounded at the time, both in Judaism and the emerging early Church. As the International Standard Bible Encyclopaedia explains: “There is more than Judaism in this false teaching. Its teachers look to intermediary spirits, angels whom they worship; and insist on a very strict asceticism” (1915 edition, “Epistle to the Colossians”). The false teaching Paul condemned contained many elements of asceticism-avoidance of anything enjoyable-which was intended to make its followers more spiritual. This deluded attempt to attain greater spirituality included “neglect of the body” (Colossians:2:23). Paul characterized the ascetics’ misguided rules as “Do not touch, do not taste, do not handle” (verse 21). These efforts only created a “false humility” (verse 23) and were destined to fail because they were based on “the commandments and doctrines of men” (verse 22) rather than God’s instruction. Paul admonished the church at Colosse not to listen to the ascetics. 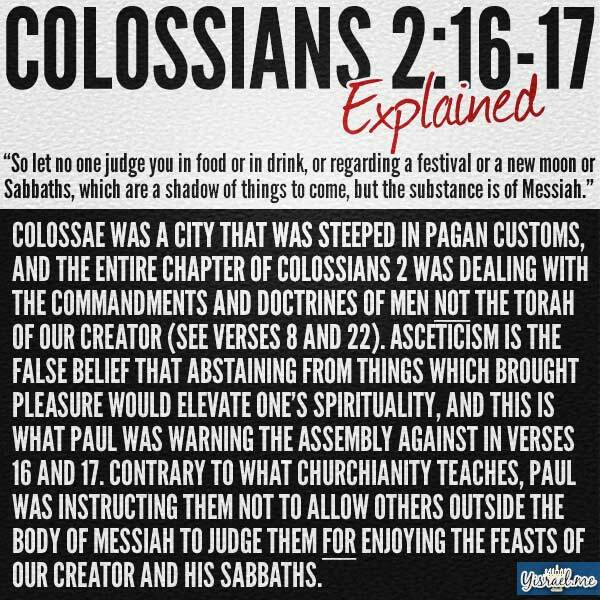 Rather than abrogating God’s laws concerning unclean meats-which some people read into this passage-Paul is instructing the Colossian members not to be concerned with ascetic teachers who criticized the manner in which the Colossians enjoyed God’s festivals and Sabbaths. Such enjoyment, although condemned by these false teachers, is perfectly acceptable to God. This section of Colossians 2 is encouragement for the Church to hold fast to its teachings and proper understanding; it is not a treatise on which foods to eat or on which days to worship God. We must be careful not to read preconceived notions into these or any other scriptures. What was the motivation of these false teachers? Did Paul warn Timothy against teachers who would advocate keeping the biblical dietary laws, or was something else at work? We know that Paul told Timothy that the Old Testament scriptures were inspired by God and “profitable for doctrine, for reproof, for correction, for instruction in righteousness” (2 Timothy:3:16), so it isn’t credible that Paul would caution Timothy against adhering to instructions found in these same scriptures. Paul discusses the true source of these heretical teachings in 1 Timothy:4:1: Rather than being founded in the Bible, these teachings originated with “deceiving spirits and doctrines of demons.” Thus the problem in 1 Timothy 4 was perverted worldly asceticism, not obedience to God’s biblical laws defining clean and unclean meats. Paul’s perspective was that “those who believe and know the truth” (verse 3) would be familiar with the scriptures that identifying which meats were “sanctified [set apart] by the word of God” (verse 5) for our enjoyment. He encouraged Timothy to remind them to let the Scriptures be their guide instead of these ascetic teachers. In a similar situation dealing with asceticism masquerading as godliness, Paul gave parallel instructions: “Therefore, if you died with Christ from the basic principles of the world, why, as though living in the world, do you subject yourselves to regulations-‘Do not touch, do not taste, do not handle,’ which all concern things which perish with the using-according to the commandments and doctrines of men? These things indeed have an appearance of wisdom in self-imposed religion, false humility, and neglect of the body, but are of no value against the indulgence of the flesh” (Colossians:2:20-23). This helps us understand the true nature of the problem Paul discussed with Timothy: asceticism, not adherence to God’s dietary laws. As we have seen, no scriptural evidence exists that indicates that New Covenant Christians of the early Church ever changed their practice of following God’s instructions regarding clean and unclean meats. Does the Bible give us any other indication regarding when and for how long this law is to remain in effect? Let’s set the present aside and move forward in the history of humanity to the time of Christ’s return to earth to establish the Kingdom of God. A clear picture of His will for the future provides additional understanding to help guide us in the present. The book of Revelation, in describing the end-time events leading up to the return of Jesus Christ, uses the expression “a haunt for every unclean and hated bird” (Revelation:18:2). If clean and unclean designations no longer exist, why did Jesus inspire this picture for John? Could it be that God is consistent and unchanging? (James:1:17; Malachi:4:4; Hebrews:13:8; Matthew:5:17-19). Another scripture that refers to the time of Jesus Christ’s return to earth presents this picture: “For behold, the LORD will come with fire and with His chariots, like a whirlwind, to render His anger with fury, and His rebuke with flames of fire. For by fire and by His sword the LORD will judge all flesh; and the slain of the LORD shall be many. ‘Those who sanctify themselves and purify themselves, to go to the gardens after an idol in the midst, eating swine’s flesh and the abomination and the mouse , shall be consumed together,’ says the LORD” (Isaiah:66:15-17). The biblical position is clear. Distinctions between clean and unclean meats existed long before the New Testament was written; they were followed by the leaders and other members of the early Church; they are currently to be observed even by their successors in the modern Church, which “keeps the commandments of God and has the testimony of Jesus Christ” (Revelation:12:17). As we have seen, they will continue in effect and will be enforced by Jesus Christ Himself. Even though first-century Christians struggled with their consciences over meat sacrificed to idols, the Bible indicates that they lived in harmony with God’s instruction regarding clean and unclean meats. Shouldn’t we also be in harmony with those laws?